”…boxing is an unnatural act. Everything in boxing is backwards: sometimes the best way to deliver a punch is to step backwards…but step back too far and you ain’t fighting at all”. So my mangled version starts out ​“Everything in rivers is backwards…”. Basically, I never seem to run out of new examples of ​“what SEEMS to happen in a river is actually the complete opposite of what really happens”. The rest of this article looks at many of the ​“backwards” things about weirs and rivers — and finishes off with a real-world case-study that is playing out right now on the River Dove. …and there are just so many other competing interests (whether it is infrastructure associated with a weir, heritage status, ownership, local opinion etc. etc. etc.) 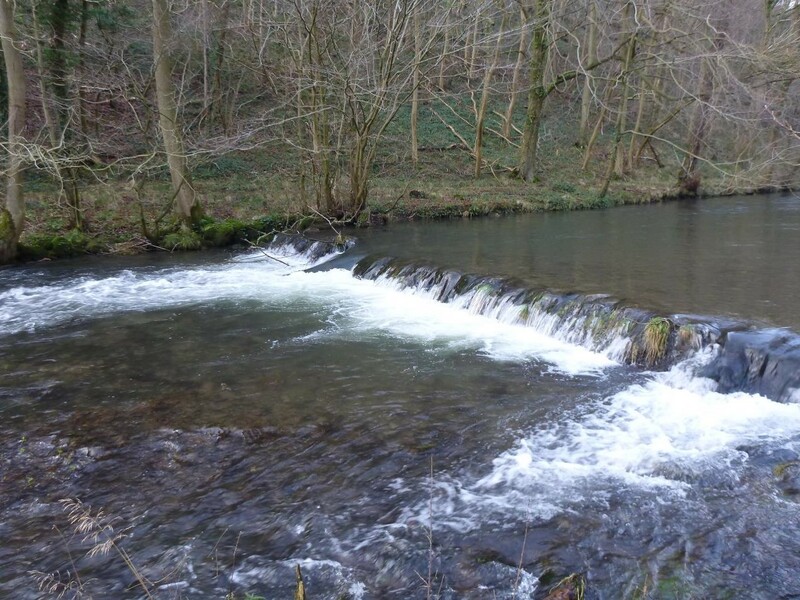 that mean most weirs are going to stay put and continue to impact on the ecological potential and status of rivers across the UK. But, like I say, I would be surprised if you have now immediately accepted the above statement (if you are in any way skeptical to start with). Basically, the question is, ​“How can I be so confident that the basic presumption should be in favour of removal?”. Also how come I’d say that to you with the same level of confidence as a quote like ​“Chemical spills into rivers are generally ​“a bad thing””? Well a lot of that is wrapped up in my mangled quote. That’s just like the way that you don’t set all the runners in the London Marathon running at the exact same time. Instead you stagger and trickle those individual starting times, spreading out the peak numbers of runners. Longer, but much lower, peaks are very often much more manageable than short duration, high-volume peaks. But again, step too far back and you ain’t fighting at all…If you slow down/​spread out one peak that used to pass through a bottleneck ahead of another; well then you might just cause a ​“traffic jam” by letting a slower peak catch up. Granted, it may not be quite as catastrophically dangerous since a ​“spread out” flood water peak is much lower, but even so. The final ​“backwards” punchline to that is it can often be best to leave the ​“fastest” (most ​“flashy”) tributaries to run ahead and to slow down neighbouring tributaries that are already a bit rougher and slower to respond to rainfall (to keep the peaks separate). More info on this kind of stuff can be found in the Slowing the Flow Final Report. In-keeping with the weirdness of rivers generally, many of the effects of weirs are strange and also almost never discussed in polite/​normal conversations. This is where we need to do a better job of taking those conversations out of the confines of geeky folks who work on this stuff for a living. It is particularly important to feed good info into the conversations that folks who have a major interest in rivers have. Folks like — Oooh, I dunno, ​“anglers”, ​“wildlife volunteers”, ​“society in general”. I know, that’s just crazy talk right? Impoundment: Basically a long-ish word that is a decent replacement for an even longer collection of other words that mean anything to do with ​“holding-water-back-and-turning-it-into-a-pond”. Impoundment can be the action of holding water back, or it could be the actual ​“pond” of water that is held back. Geomorphology: The shaping of landscape features by the weather rubbing away bits of rock and moving those bits somewhere else. That ​“weather” is really ​“wind” or ​“water”. For rivers, it means the ways that water washes stone, sand and silt off the hillsides and riverbeds…and then pushes that material around to temporarily make different shapes of river channel before it eventually ends up in the sea. This is the obvious one and, often, the only effect that is spoken about. It is very easy to see that if you have a species that needs to migrate from where it lives as an adult (e.g. the sea) to somewhere else (e.g. the middle and upper parts of a river); then barriers that cut off access to spawning grounds are a problem. But it’s more complicated than that. Anything that inhibits to some degree (not just PREVENTS) natural movement of fish can have serious biological consequences. This is especially true where multiple structures exist on a river (which is incredibly common). Look I know it’s a bad joke to drop quotes like “…the orchard walls are high and hard to climb” or ​“For stony limits cannot hold love out” etc. and to compare that to horny fish divided by a stone weir, but it’s probably a decent way to paint a picture of something called the Wahlund effect. This is when you should have one large breeding population (where ideal combinations of genes in offspring can be created by mating between individual parents who get to choose each other). In that situation, there is not a significant restriction on the ​“flow” of genes between different members of that breeding population. This is important because the odds are greatly in favour of any genetic changes in that population being driven by useful adaptations to the environment. This is especially important in species (like trout) that tend to ​“home” to the spawning grounds in which they, themselves, were born. 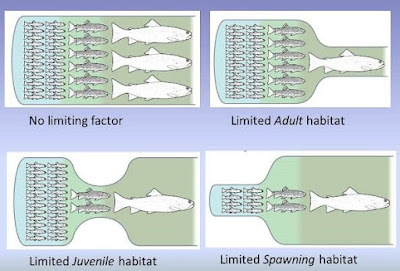 If you think about it, homing to your own spawning grounds carries quite a risk of breeding with someone you are closely related too (and all the ​“inbreeding” negative effects which go along with that). The clever thing is that trout, salmon and other fish can actually SMELL how compatible they are with a potential mate (at least in terms of the immune system that their mating would produce in their ​“children”). Although it looks like a complete scramble when fish are spawning, when you look at the parentage of offspring that comes from that chaos (using genetic analysis)…it is always just different enough (mathematically) from what you would get by randomly mixing milt and eggs. Not only that, but the offspring that result where ​“mate choice” is possible have stronger resistance to disease and get rid of parasites better than offspring produced by artificial (random) mating. Here’s one example of how that mate-choice, immune system compatibility and parasite resistance in offspring was confirmed. So those subtle improvements in immune system strength have measurable biological consequences for survival and reproduction (and hence resilience) for wild fish populations. 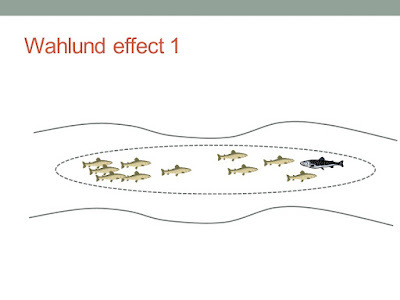 The removal of ​“mate choice” in supportive breeding (hatchery/​wild brood-stock) programmes is the major stumbling block which means wild-spawned fish consistently (and massively) out-perform supportive breeding efforts in tagging studies of wild versus hatchery fish. Say you were given a velvet bag of 1000 coloured beads (made up of 500 red and 500 blue) and you were not told how many of each colour were in the bag. Then, if you were allowed to draw out a quarter of those beads…how confident would you be that you could correctly guess the true proportion of red:white beads (within a few percentage points either way)? 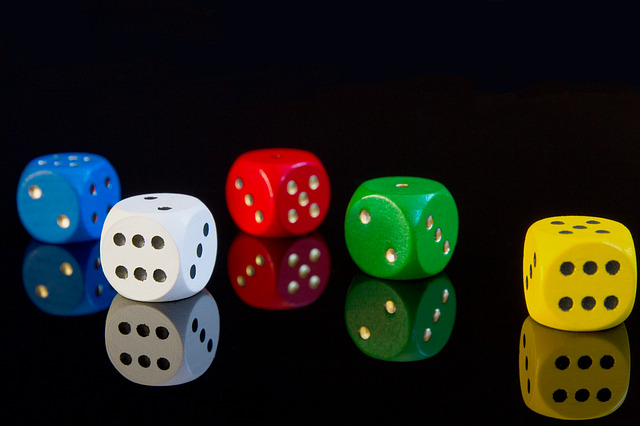 Having a nice large number to count takes away so much of the influence of pure chance — and lets the true pattern shine through. Now take the same bag and you are only allowed to draw 4 beads out and count them. How likely do you think it is that you’ll get exactly two red and two blue beads?? How much of an impact does getting just ONE extra blue (or red) bead make to the proportions you see? How much of your mortgage would you bet on guessing the true proportion in the bag of 1000? That makes it easy to see how, the smaller the group, the more likely it is that an individual event can have a really big effect on results. In genetics terms, the smaller the breeding population, the bigger the effect of one specific individual dying (or otherwise failing to mate) starts to have on which genes are passed on to offspring. That makes it MUCH more likely that, at some point, there will be a significant and completely random jump in the genetic makeup of a breeding population…And those random shifts in genetic make-up (when compared to genetic changes that genuinely provide adaptations to local conditions) are associated with increased risks of population extinction. 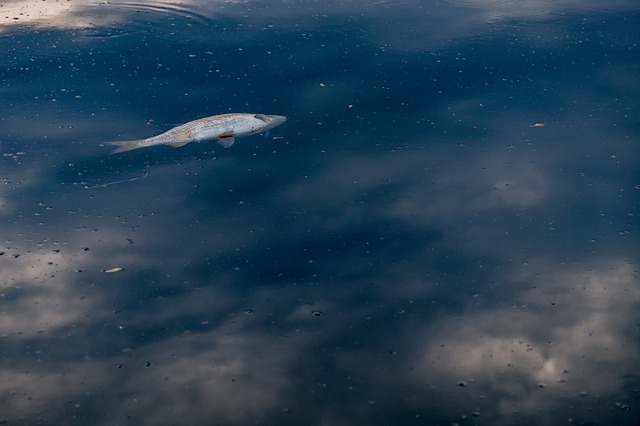 The reason that this is such a threat is that, until that random change happens, you will not be able to see any indication of a problem in the wild fish populations that you have. Even after it happened — the fish themselves would be unlikely to look any different (at least not in a way that suggested they were headed for trouble). It is a bit like Nassim Taleb’s idea that you don’t need to know which specific truck is going to fall through a weak bridge…it is just important to know that the bridge is weak in the first place (and either avoid it or strengthen it). The problem comes when trying to convince someone that their wild fishery (that is currently producing plenty of fish to satisfy members of their angling club) that they ​“Have a weak bridge” and there WILL be a truck heading for it at some point in the future. Whether that truck arrives sooner or later is impossible to predict…But just because a scientist can’t predict exactly WHEN, is not the same as saying ​“Those scientists know nothing”. Big difference in fact. This is a fairly simple one, whether it is the ability to swim out of a polluted area — or to recolonise a section of river that has been wiped out by pollution — free upstream AND downstream movement of fish is essential. 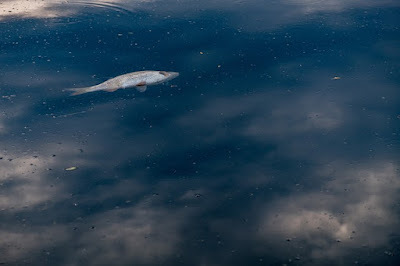 Even partial limitations on the ability of fish to move to escape pollution will be fatal to a higher number of fish. Then at what point does that drop a breeding population into the ​“Russian Roulette Genetic Drift” zone? What would that situation look like if you had created great habitat and wonderful water quality? If you had a local population extinction due to genetic drift, how long would you be chasing your tail trying to find the mystery pollutant or shadowy predators that caused your fish to disappear? Isn’t it better to insulate yourself against the chances of that by making sure DOWNSTREAM and UPSTREAM connectivity is as high as possible? Now those are some examples of the effects that weirs have when the structure itself is a partial (or even complete) barrier to free movement of fish. But what is the problem with just holding water back to make it deeper and slower? I’ll try to segway seamlessly into this bit from the previous section by sticking to the theme of migration. 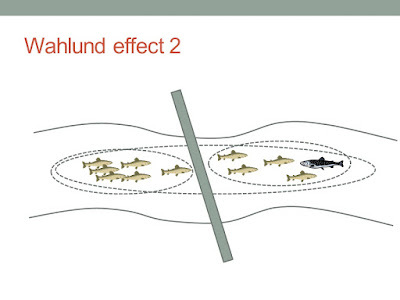 Specifically, the problem to downstream migration of ​“smolts” (juvenile salmon and sea-trout) headed for the sea. Each impoundment that they encounter causes them to lose their way due to the lack of current. This is because they migrate downstream ​“tail-first” by allowing themselves to be swept along with the flow. When the water is ponded, that guidance system no longer works. Not only that, but smolts only have a certain ​“window” of time in which to make it out to sea before their physiology changes back to a state that means they cannot survive in salt water. 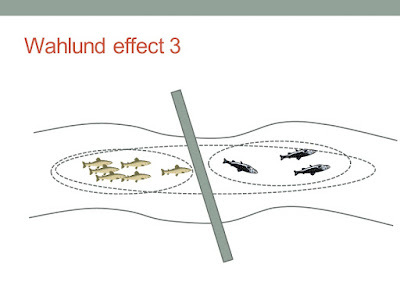 If smolts need to pass multiple impoundments on their way to sea, there is a great risk that their window for migration closes before they can reach their destination and become adult fish. 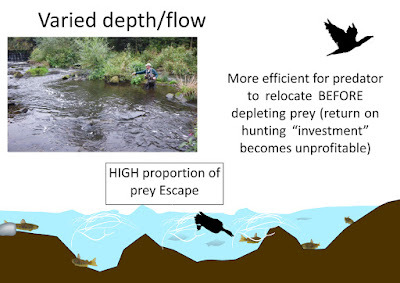 When that effect is compounded by the increased risk of predation in such ​“simple” habitat — mortality rates of over 80% have been observed due to a single low-head (in-river) weir impoundment. Higher rainfall appears to reduce this impact — but still well over half of the smolts failed to escape the impoundment even with higher flows. Don’t forget that juvenile ​“resident” trout will also often need to migrate downstream to find an unoccupied adult territory patch in order to mature and, in time, successfully reproduce. The simplification of habitat upstream of weirs is caused by the energy of the water being taken away by raising the surface level and holding the water back behind the crest of the structure. That simplification reduces the overall number of species that an live in the impounded reach. Habitat diversity broadly maps onto biological diversity. But why do unimpounded reaches have more diverse habitat? How does net erosion increase? It is to do with the water no longer carrying as much eroded material (because that gets dropped behind the weir). The water downstream still scours the riverbed, but there is no longer a mobile supply of material from upstream to ​“patch up” or form new deposited structures. 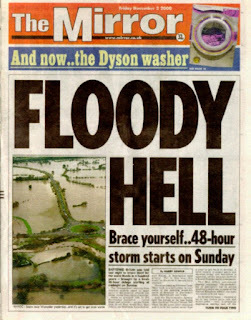 Hence, a rise in net erosion of the stream-bed. 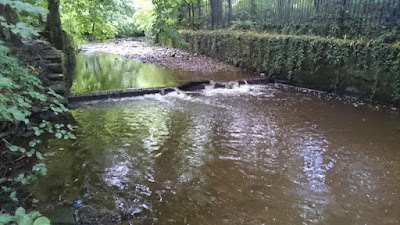 Another weird thing is that weirs make the surface of impounded reaches horizontal…Now (again a backwards thing), it seems sensible to assume that, apart from waterfalls, most water in rivers is roughly horizontal. But actually, that’s a very special case of when an impoundment forces water to become ​“self-levelling” by stopping it from flowing downhill. In unimpounded reaches, the water is broadly parallel with the RIVERBED (and not the horizon)…and since rivers flow downhill, that riverbed is angled down (however subtly) from the hills to the sea. That sapping of the flow energy often creates long, flat pools of water. In turn, that greatly increases deposition of sediment. Slowing the water by holding it back behind a weir also starts to hold sediment back behind that weir. Effectively, the bed-slope in the impounded reach approaches zero. The essential structural variety that diverse communities of insects, plants, fish, microbes rely on is taken away by the interruption of the riverbed material ​“conveyor belt”. 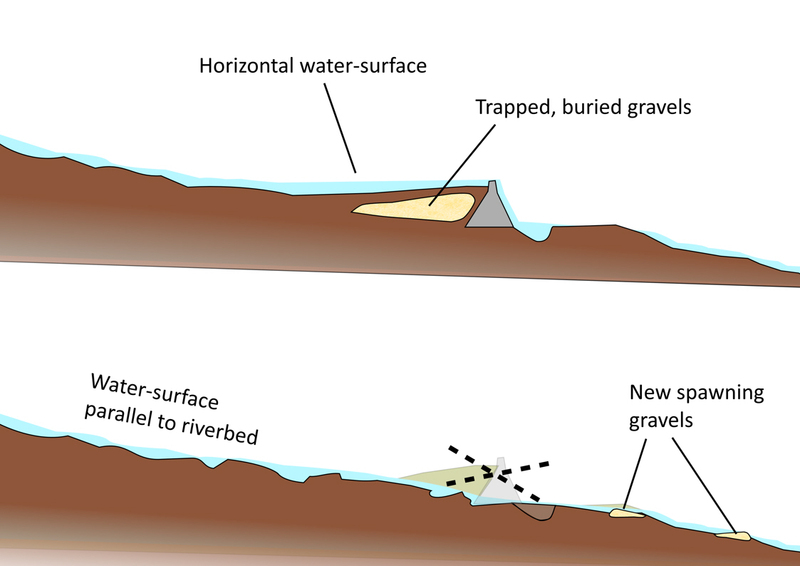 There is also a risk that nutrient-rich (or other pollution-rich) sediments will accumulate behind weirs, rather than being dispersed and, essentially, ​“diluted” by other clean sediment. Just one ​“step” in a river — and the longer-term effect of its removal as the bed re-grades to a natural bedslope. The redistribution of accumulated material from directly above the weir to downstream reaches will probably be immediately very obvious. But, the overall re-grading of the longitudinal bed-slope could take a very long time to approach natural (pre-modification) conditions. To put it into context, the riverbed would probably still be ​“responding” to the installation of the weir for several thousand years before it reached equilibrium (!!). Similarly, I’d guess that it could easily take at least the same amount of time as the ​“duration that the weir had been in place” to return to a pre-modified state. Part of the ways that these things play out is that the slow, often relatively deep (but getting shallower all the time) water above the weir suddenly becomes WAY shallower and faster. That can be a bit disconcerting for anglers who are (usually) interested in catching adult fish rather than juveniles. But, the checks and balances in place are complicated (and, yes, pretty ​“backwards”). First of all, re-starting the conveyor-belt of gravel is a shot in the arm for spawning success. That’s especially valuable when potential Wahlund effect barriers are broken and fragmented breeding populations can re-join. Several layers of ​“insurance” against extinction are immediately put in place (reduced potential for genetic drift plus improved chances of survival from those free-mate-choice breeding efforts). Some more subtle effects are that the greatly-increased speed of (shallow) flows upstream of the weir will be acting to scour and drive down the riverbed until something like a natural equilibrium is reached. It is a leap of faith but, overall, instead of two bits of deep water (the bit above the weir and the bit scoured out directly below the weir), re-establishing natural geomorphological processes will create far more good habitat for ALL stages of (for instance) trout life-cycles. Including Adult Fish. The key guiding principle of the Wild Trout Trust is exceptionally useful to flag up here. That is to seek to provide good quality ​“Spawning”, ​“Juvenile” AND ​“Adult” trout habitat — and to ensure connectivity between those crucial habitat types. That way, wild and self-sustaining populations of trout are given the best possible chance. It would be senseless for the WTT approach to not equally address adult habitat bottlenecks alongside spawning & juvenile habitat. The aim is no limiting factor at any of the three key lifecycle stages. Scour pool habitat formation has a massive advantage over impoundment pool habitat. Namely, scour pools are ​“self-cleaning” when it comes to blowing silt and fine sediment away. In contrast, impounded pools act as wicked sediment traps. The best sediment traps you could design actually — since they span the width of the river. That’s why they simplify the habitat — by creating an expanse of only one kind of habitat in terms of flow velocity, depth and substrate. In contrast, geomorphologically-active reaches create pool habitat, riffle habitat, mid-channel gravel bars, slow, muddy marginal areas.…In other words a full patchwork that suits a whole range of species (and a whole range of lifecycle stages within those species). A patchwork is also the greatest advantage that an angler can have (because of the ​“hedged bet” opportunities provided regardless of the time of year/​predominant hatches). 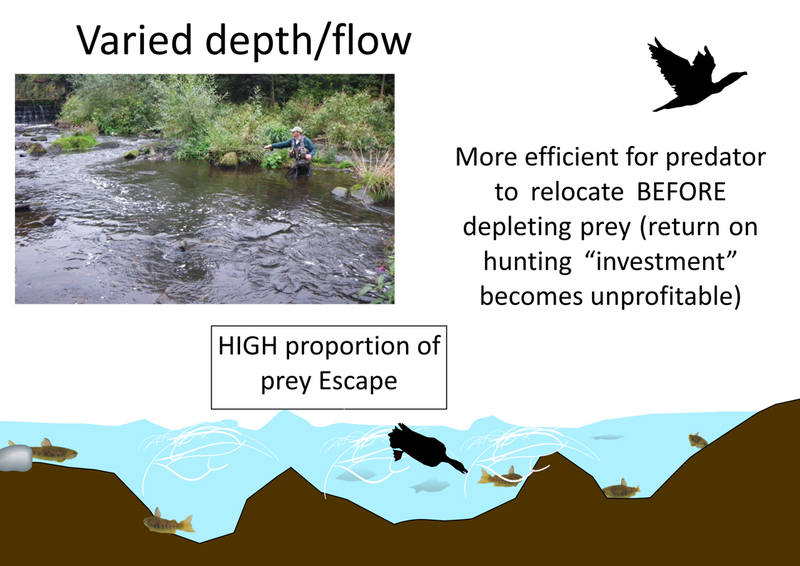 If there are fish feeding somewhere, you have a much better chance of finding them in a ​“diverse portfolio” of depths/​flows than in the ​“all eggs in one impounded basket” condition behind a weir. The controversial point is that, when stocked trout are present, they can often look for the conditions that they are most familiar with and adapted to. That is why you often get pods of stock fish congregating on the upstream side of weirs. In the most basic terms, it is the most similar habitat to a stew pond. Now, it’s a fishery manager/​club membership decision as to whether you prefer to catch wild or farmed fish. It is helpful, though, to have information (no matter how“backwards” it seems) on which to base those decisions. One thing to bear in mind if your club membership enjoys both wild and stocked fishing is that those congregations of stock fish will be pretty attractive to mobile avian predators. Introducing adult stock fish will inevitably increase competition for resources (like ​“predator-free” space or any other competitive interactions). This explains the very common pattern of increased fish numbers caught after a few years of stopping stocking. Which is a totally backwards result. 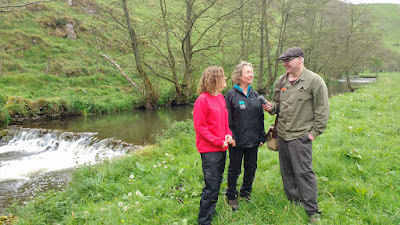 Improved Trout Stock Management from Wild Trout Trust on Vimeo. A pattern that plays out on wild-only fisheries is the great difficulty of catching fish in impounded reaches for most of the year. Although this article that we did for Trout and Salmon Magazine was a fun, one-off experiment; it is a scenario that plays out time and time again on the wild trout rivers that myself and others fish. In a nutshell, the photo below shows the number of fish caught below the weir (yellow counter) versus the single fish (green counter) above the weir in impounded habitat by 6 x National Rivers Champion John Tyack in two 90-minute duration sessions on a productive day. The sections were each 300m in length. 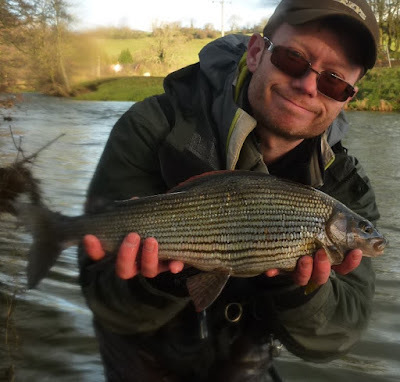 John Tyzack had a fish on both of his two flies on one cast! But you could say that this is ​“correlation” and not ​“causation” (no matter how repeatable it is). In other words, what is the reason to believe that the impoundment is the cause of reduced biological richness? Plus, could it just be that fishing works better in the more varied water? Although, if you’re an angler, that difference in effectiveness actually still doesn’t argue for increasing impoundments if the best fishing grounds are in unimpounded reaches. For example — what if you currently have decent hatches of invertebrates in an impounded section. What reason would you have to believe that hatches could be improved by removing an impounding structure? 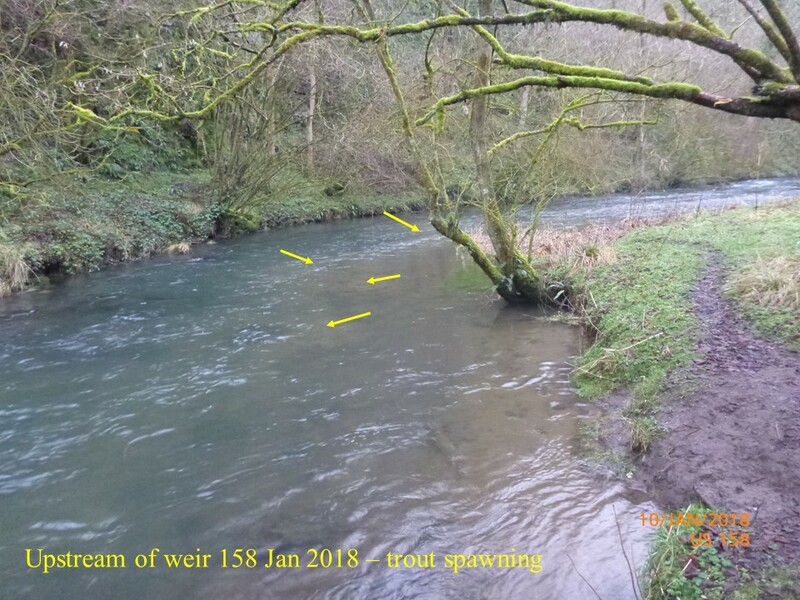 Here is some weir ​“notching” work done by Jon Grey in partnership with Aire Rivers Trust, The Environment Agency and Yorkshire Wildlife Trust. You can see from the photographs below that this example weir (of several tackled) is very small. It would seem really unlikely to be able to have any effect on invertebrates on the upstream and downstream sides of such a small structure. A small, low weir on the Eastburn Beck — this couldn’t be affecting hatches surely? 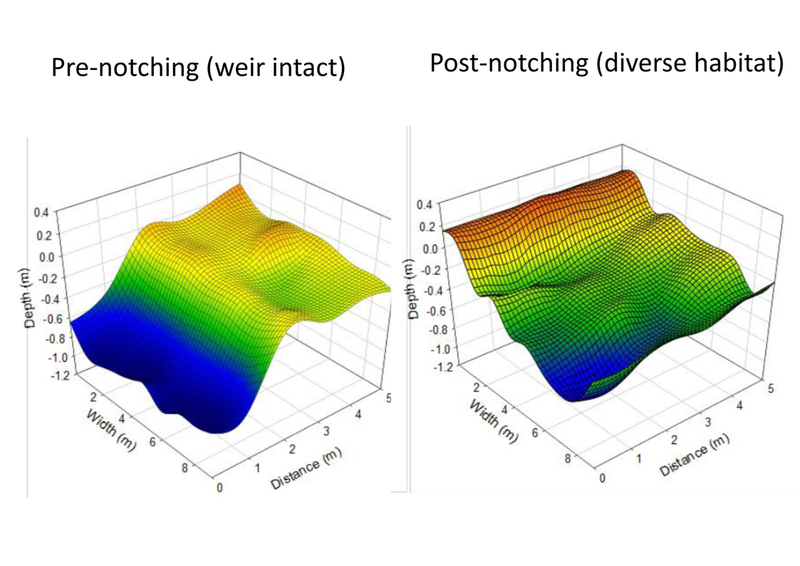 Although the topography measurements show a clear increase in structural diversity in the riverbed after cutting a notch into the weir (large enough to remove the impounding effect), would this really map onto any change in hatches of insects? Well, here are some results from invertebrate community sampling associated with the ​“pre-notched” and ​“post-notched” section of river. 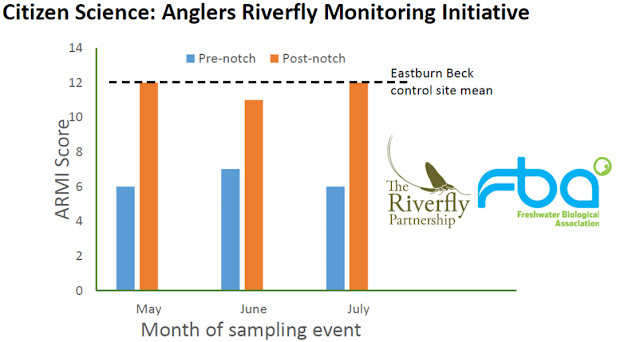 The numerical scores relate to the number of different ​“Riverfly” types (of direct interest to fly fishers) and they are compared to a ​“control” site (with no weir) on the same stream. After notching — the numbers of different ​“hatches” of Riverflies increased dramatically — recovering towards levels on un-degraded reaches elsewhere on the same Beck. Note the doubling of the Anglers’ Riverfly Monitoring Initiative (ARMI) score in both May and July results — and not far off doubling in June as well. (graph courtesy of Prof. Jon Grey). Notice that it wasn’t the case that there were no Riverflies in the ​“pre-notched” condition — but that those numbers of different species were clearly being depressed by the presence of the impounding structure. 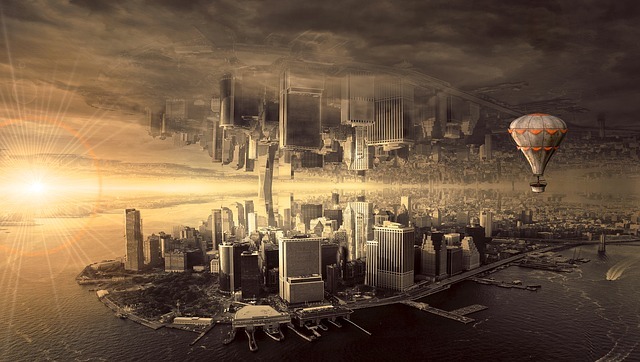 This is exactly the same type of effect that pollution has on more-sensitive (versus less-sensitive) species. In other words, the only species that can survive in particular places are the ones that are not sensitive to any given impact (whether that is chemical pollution or physical habitat degradation). With those ideas in place, it is a good time to consider that all the above factors will vary in complex, combined ways in different cases. At the same time, all of this is operating against the background of many weirs having no realistic prospect of being notched or removed in the foreseeable future. 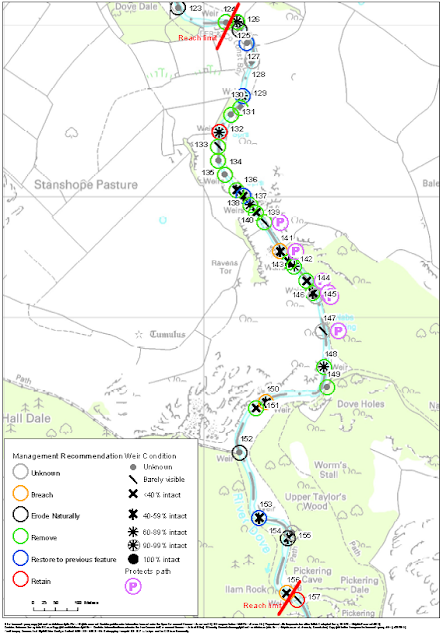 A partnership project to reduce the number of artificially-impounded reaches on the Dove is being undertaken by fishing clubs, farmers, Natural England, the National Trust, The Environment Agency, The Wild Trout Trust the Peak District National Park and the Trent Rivers Trust. It’s called ​“Letting the Dove Flow” and you can read more about this project in the Sheffield Telegraph for additional background information and a general overview. Most of the 177 (!!) weirs on the sections of the upper River Dove that are subject to the ​“Letting the Dove Flow” project were built after 1923 by a chap named F J Brice. Of course, since featuring in the Compleat Angler (by Izaak Walton; 1593AD to 1683AD), the Dove has assumed great importance in the heritage of western fly fishing. 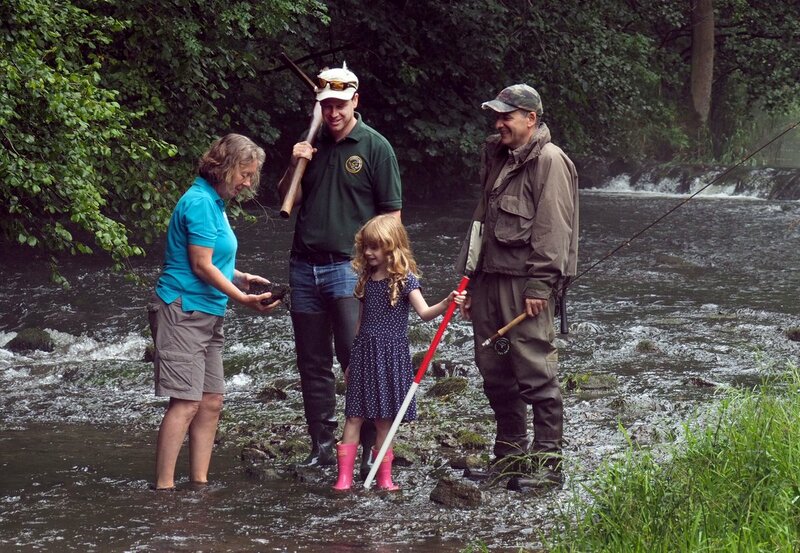 Although there appears to be an increase in interest towards fishing for wild trout on the Dove, there are still substantial numbers of stock fish introduced to the river in order to support catch and kill fishing — or for other sporting amenity reasons (e.g. published catch return data). This means that, as well as the comparatively recent installation of weirs, the routine addition of stock fish make the Dove a much different proposition than the river that Izaak Walton and Charles Cotton fished. The thorny question of ​“what era, in angling heritage terms, is the most valuable historic condition to seek to preserve or restore?” is raised by the 1920’s changes to the river. 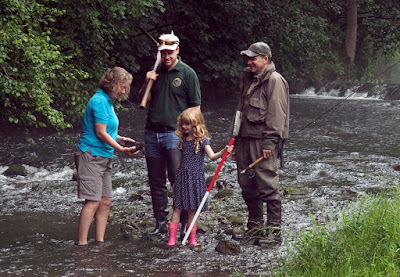 Ultimately the answer to that question is closely tied to how much value can/​should be placed on wild, stream-bred fish. For many of the weirs in question, under a reasonable range of conditions, a good proportion of adult trout should be able to pass upstream. 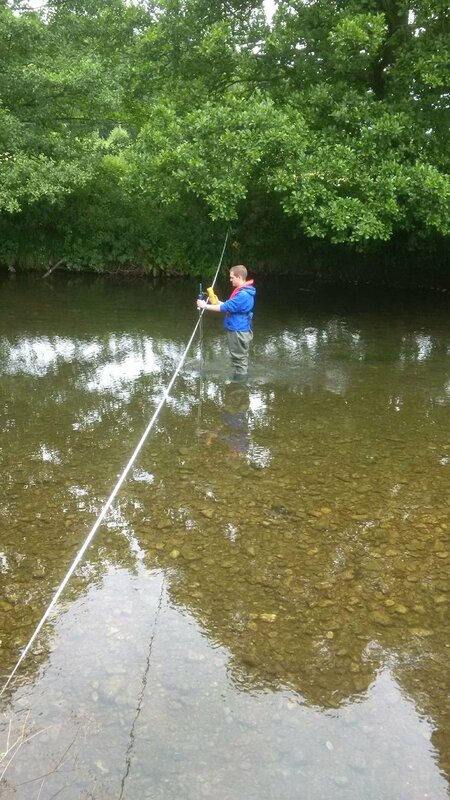 Similarly, adult trout movement downstream should be possible in a broadly similar proportion of cases. This means that, in many cases, at least some of the risk posed by the Wahlund effect should be mitigated. Don’t forget, though, that these structures will still have some potentially important impacts (in isolation and as a cumulative impact) simply by making fish work harder to pass them. 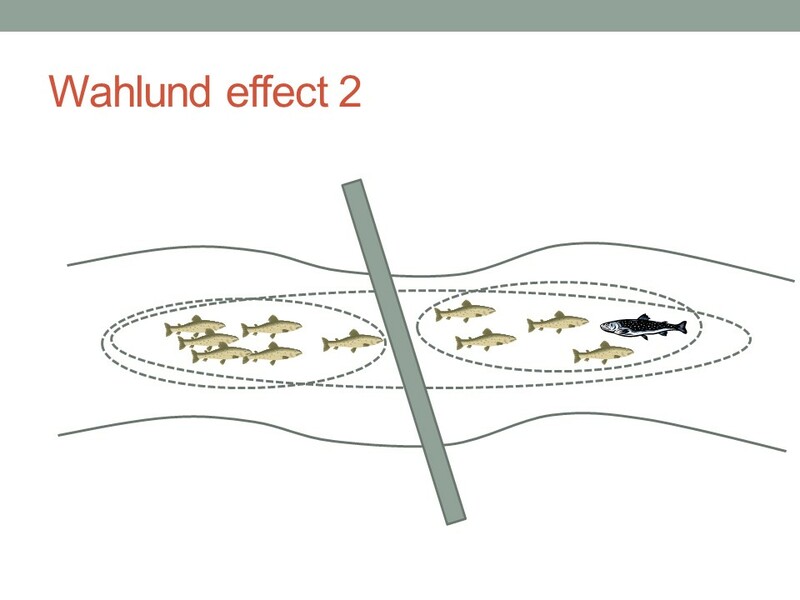 At the same time, there are structures that will be complete barriers to migration under almost all conditions (and to almost all fish; like the one in the video below on a post-industrial river in Yorkshire). In between those extremes, there are many ​“intermediate” condition barriers that impose biologically-significant restrictions on free movement of fish. ​“Non Migratory” trout trying to migrate from Paul Gaskell on Vimeo. Overall, being completely objective, for the sheer number of weirs, there are likely to be rivers other than the Dove where the simple impassable nature of most barriers are having a much worse effect. Even so, there are clearly sufficient cases where (simply based on improved connectivity alone) that there would be a valuable increase in the amount of ​“insurance” against genetic drift effects. 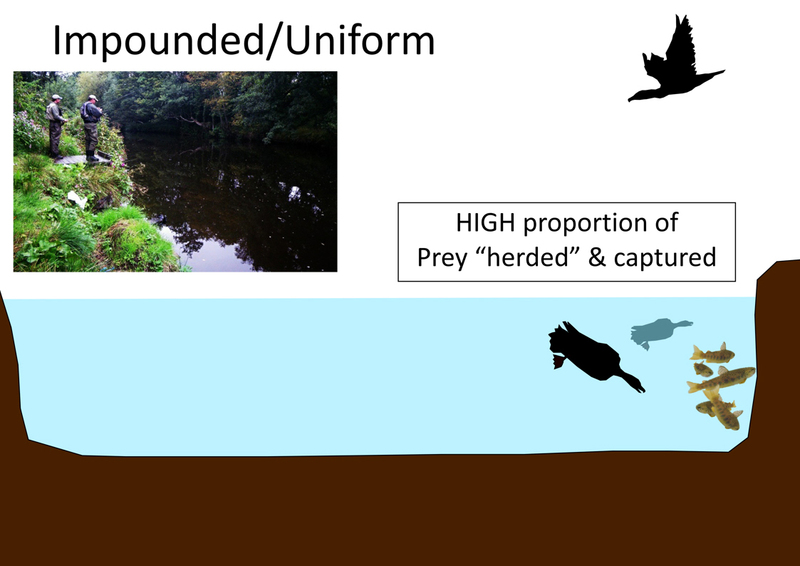 The far greater structural diversity notable in unimpounded reaches (and the known improvement to biological diversity) is the most significant benefit to weir removal on the Dove. 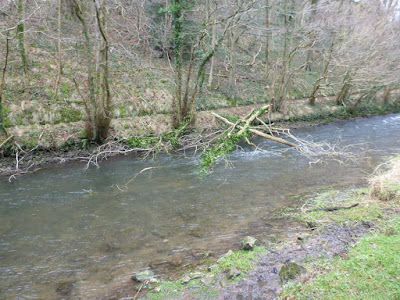 Of course, alongside the reinstatement of a greater potential for geomorphological processes to create a more natural bed-slope, it is possible (and desirable) to avoid creating population bottlenecks for wild trout. 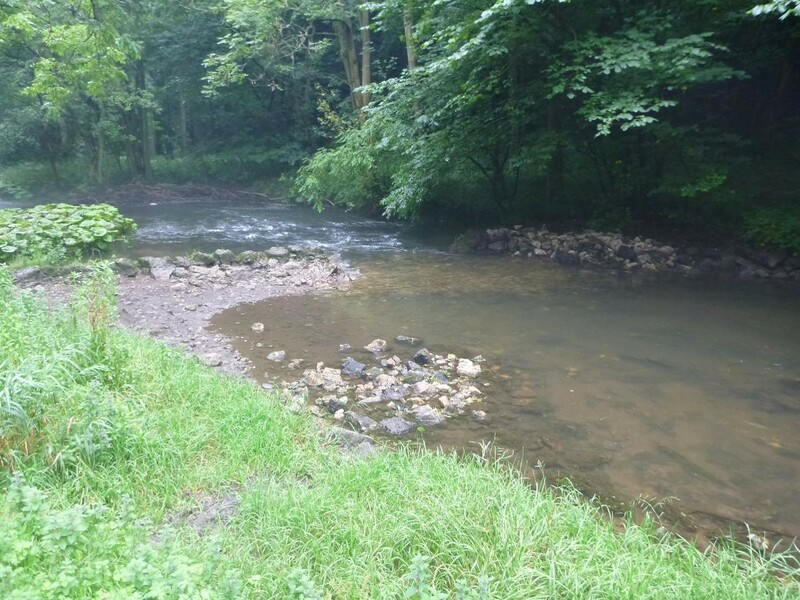 This includes natural generation of adult trout habitat (as well as improved spawning). Another ​“Cinderella” lifecycle stage is ensuring the presence of submerged ​“brash” cover to help juvenile fish survive their first perilous year of life. 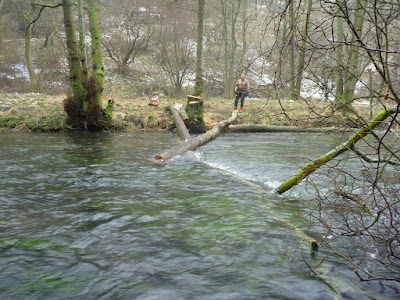 The inclusion of stable woody material installation in the work on the Dove is very much part of that provision for both adult and juvenile fish. Promoting areas of localised bed (instead of bank) scour encourages those great ​“self-cleaning” pool habitats to form. Wild fish love this type of holding spot and those exact structural features were what allowed John Tyzack to catch an adult trout every two minutes and 48 seconds (on average) throughout a 90-minute session on free-flowing scour-pool habitat covering a 300 m reach below the weir in our experiment. In addition, something to bear in mind is that there will be further channel modifications (and surrounding land use) that mean removal or notching of a weir is only one step in creating better habitat. It is not the case that weir-removal alone will relieve all the pressures on a watercourse. The timescale for the bulk of the benefits to be generated can also be quite considerable. But, without taking the first step of increasing the potential for rivers to redistribute bed material, there will always be a serious limitation on the general biological (and specific fisheries) improvements that can be achieved. You would be forgiven for thinking that I’ve been writing this article solely from the perspective of a fisheries biologist and river habitat professional. In many ways that is true — but only because I can’t really separate that out from my love of fishing those rivers. To me the improvements that are already beginning to show through the activities of Letting the Dove Flow are creating a better present and future for fishing on the river. So, that being said, I will offer some doses of realism that need to be flagged up. Not all benefits will be instant: As mentioned above, the ​“steps” in riverbeds which form in response to weir installation are unlikely to have reached equilibrium even though they were built in the 1920’s. It is likely to take a comparable amount of time before the influence of a weir becomes essentially undetectable. It might take you a little while to relocate good fishing spots: When you remove an impoundment, some spots where you used to be able to find fish will disappear. 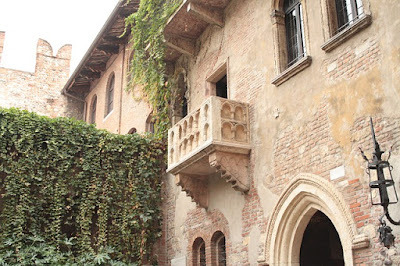 But overall, there will be a greater number of suitable spots created in return. Rivers SHOULD move around and change. One of the signs of a degraded fishery is where riverbanks and pools are ​“locked” in place by engineering measures. Be careful not to over-emphasise the ​“banker” fish spots that you might lose — at the expense of under-valuing the several more ​“new banker” spots that have been created. Not all individual weir-removals will have the same impact/​timescale: The benefits from each individual weir removal will vary! That is true of the TIME taken to see noticeable improvements as well as the SIZE./SHAPE of those effects. 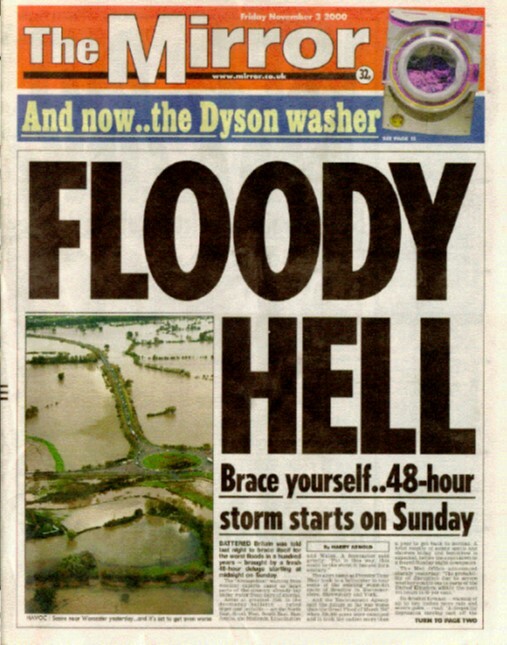 It is even true to say that some weir removals will be much more beneficial than others. But the cumulative benefit of all those (even small) effects has huge significance for the ecology of the Dove (and associated fish populations). 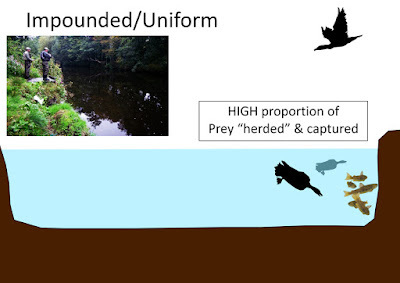 There is NO Fish pass that is as effective as no weir: That is especially true of downstream juvenile migration — but it is incredibly important to recognise that different species (as well as different individuals within the same species) all have different abilities to navigate over/​around obstacles. Many of the most serious threats are ​“weak bridge”/future impact risks: When things look fine (whether that is current hatches or fish populations) right now — but where a biologist has good reason to suspect that there are fragilities in the system; those can be the most dangerous scenarios for your river. Put simply, this is because everyone sees it as ​“crying wolf” and action is unlikely to result. Working these ideas of ​“Russian Roulette” situations into the general conversation would produce a massive protective effect for the wild fisheries of our rivers. Other weak links in the chain also need to be fixed: If, as well as the impoundment impacts, there are other ​“weak links” — those will also need to be fixed before the full/​any benefit from the weir-removal can be seen. Note that this is not an excuse to leave damaging impoundments in place, but it is imporant to judge the impacts of weir-removal fairly in the context of other pressures. Well, although this is intended to be a living document that I will update and modify in response to new developments and feedback; I think that is enough for now!